ADVANCE CAN Driver is a unit to operate ADVANCE gauges by taking out ISO-CAN data from an OBDII connector. 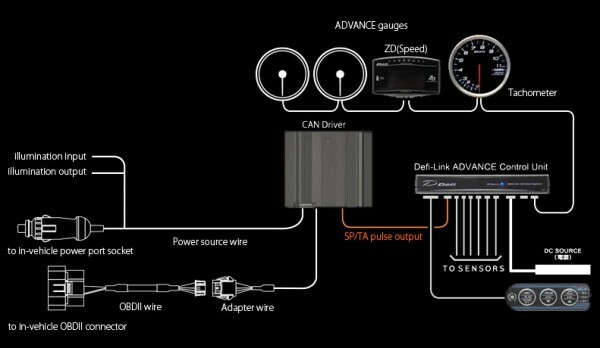 This product is for people who want to install ADVANCE gauges easily without sensors and for vehicles which engine speed signals cannot be obtained from ECU. Vehicle information from OBDII can be sent to gauges without connecting sensors. Speed and engine speed signals can be sent from OBDII to an ADVANCE tachometer or ADVANCE System (if installed) even from vehicles which those signals cannot be obtained from ECU. Illumination ON/OFF signals can be sent to ADVANCE System from vehicles which illumination switching of Defi products doesn’t function normally because of illumination controlling (such as European illumination pulse vehicles). Peak and warning values can be displayed. The illumination color for ADVANCE CR/RS can be changed. Refer to manual for the details. 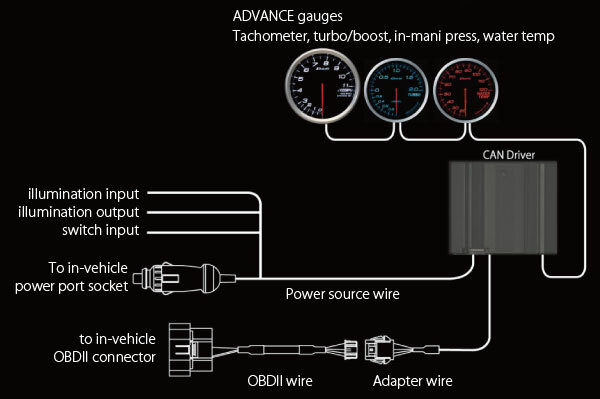 *Three gauges can be connected to one CAN Driver. Do not more than three gauges. *Gauges other than listed ones above cannot be connected. *ADVANCE ZD cannot be connected. *CAN Driver cannot be daisy-chained to the ADVANCE link system. *ADVANCE BFs are white models. *60mm set is 9000RPM. 80mm sets are 11000RPM. Please ask our official distributor/wholesaler near you about the prices and the compatibility with your vehicle. 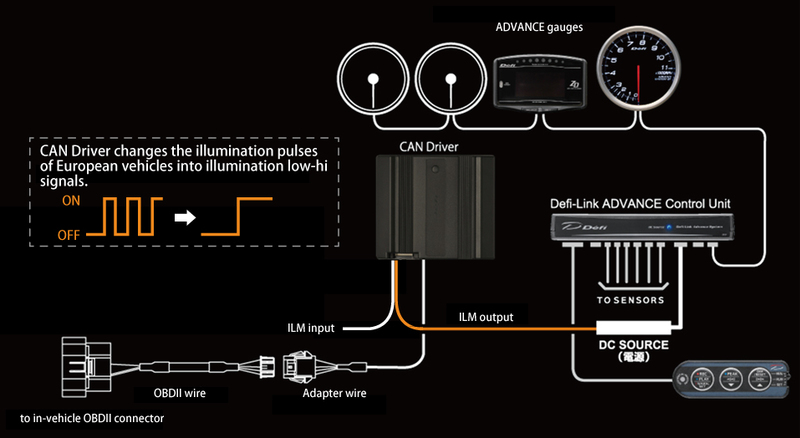 This product can be installed on only vehicles with OBDII connector which is compatible with ISO-CAN. We don’t have information on vehicles which are sold outside of Japan. Please make sure that your vehicle is applicable to this product at a shop of Defi products or contact our distributors before purchasing.